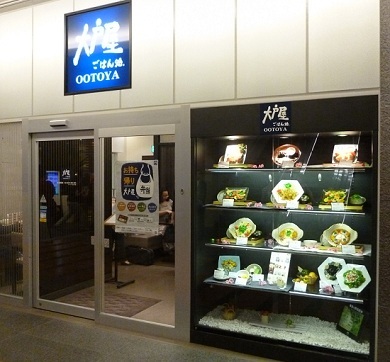 Ootoya is a chain of restaurants that serves, guess what….. Japanese food. What I really like about this restaurant is that everything is teishoku which means “set menu” and all the dishes come with a bowl of miso soup, a small portion of shredded cabbage, a side dish of pickles and a bowl of rice. I love eating this way as I feel like I am eating in a traditional Japanese way. If you stay at an onsen hotel and eat in your room, the meals are normally teishoku. Another thing about Ootoya is that it’s cheap! I love my cheap foods, but Ootoya seems to have a bit more of a classy feel compared to other Japanese fast food joints where it’s just get in, eat, and then get out. There are lots of branches in Sapporo Japan but I have only been to one of the two branches near Sapporo Station, so it’s very conveniently located. 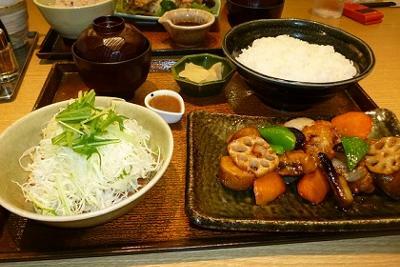 The menu is substantial and has plenty of dishes ranging from nabe, to stir fried dishes like sweet and sour pork, to grilled fish, to soba (buck wheat noodles) and much more. All the dishes are accompanied with photos so if you can’t read or speak Japanese, no problem, just point and say “kore onegaishimasu”. Also an added bonus with the teishoku is that you can choose different kinds of rice and sizes for no extra charge. They have regular rice, of course, then they have a kind of purple rice with beans in it, and brown rice. I went for the sweet and sour fish( some of kind of white fish, maybe plaice?) 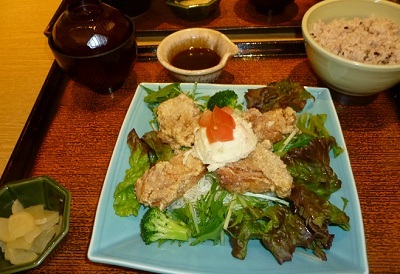 and my friend ordered fried chicken with vegetables. Without drinks the bill came to about 1,600 yen for two of us and we were both pleasantly stuffed. There is also alcohol on the menu and you can have unlimited soft drinks for 200 yen. 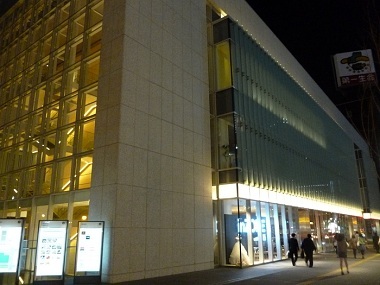 Address: North 3, West 4 Basement 1 of Nihonseimei Sapporo Biru, a huge glass building built at the end of 2011 along Ekimai Dori.